Catholics have often endured the charge that we are an unbiblical Church. Strange accusation, really, for the Church that collected the Scriptures, determined the canon of Scripture and preached it for 1,500 years before there ever was a Protestant denomination. The fact is we are quite biblical and often in ways that are stunningly powerful. For the Church, the Scriptures are more than merely ink spots on a page. The Scriptures are manifest and proclaimed in how we live, how we are organized hierarchically, our sacraments, our liturgy and even in our buildings. Long before most people could read, the Church was preaching the Gospel. And to do so, she used the very structure of her buildings to preach. Many of our older builds are a sermon in stone and stained glass. The Scriptures come alive in our art, statues, paintings, and majestic stained glass windows that soar along the walls of our Churches like jewels of light. Even the height and shape of our older churches preach the word. The height draws our sights up to heaven as if to say, Since you have been raised to new life with Christ, seek the things that are above where Christ is seated at God’s right hand (Col 3:1). And the shape of most of our older churches is the shape of a cross. As if to say, May I never glory in anything, save the Cross of my Lord Jesus Christ (Gal 6:14). My own Parish Church is a sermon in stone and wood and glass. It is designed around the Book of Revelation, Chapters 4 and 5 in which John is caught up into heaven and describes it in detail. 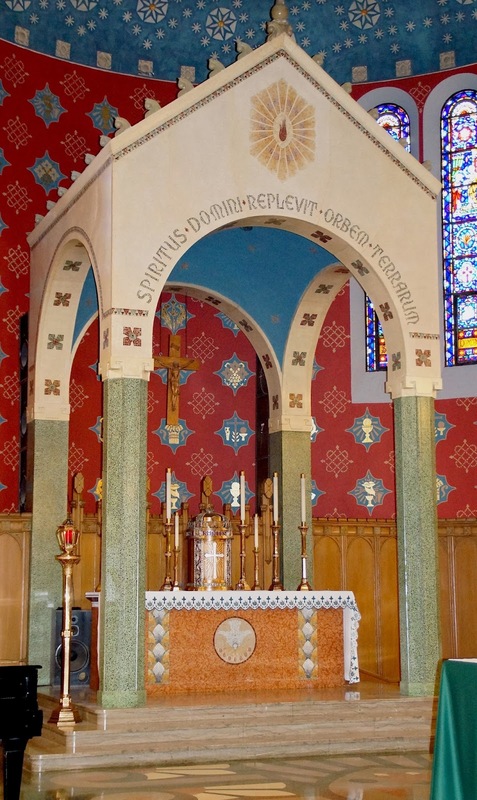 The fundamental design of the sanctuary drawn from Revelation 4 and 5 includes the throne-like altar (Rev 4:2), seven tall candles around the throne (Rev 4:5), the four living creatures in the clerestory windows above the altar (Rev 4:6-8). At the center of the altar is the tabernacle wherein dwells the Lamb once slain who lives forever, Jesus (Rev 5:6). Around the throne (altar) are seated the twenty-four elders (Rev. 4:4) symbolized by the 12 wooden pillars on the back sanctuary wall and the 12 stained glass windows of the Apostles in the transept windows. The multitude of angels who surround the throne (Rev 5:11) are symbolized by the blue and gold diamonds on the apse wall. In effect the builders of my Church (built in 1939) were saying, when you walk into this church, you have entered heaven. Indeed, it is a replica of the heavenly vision of John. And when we celebrate the liturgy it is more than a replica for we are taken up to heaven in every Mass where we join countless angels and saints around the heavenly altar. There we worship God with them. We don’t have to wait for some rapture, we go there in every Mass. But there is more! For what John saw in heaven is none other than what God had prescribed to Moses. Moses was told quite explicitly by God how to construct the ancient sanctuary, the tent of Meeting in the desert. The layout, materials and elements are all carefully described. And, having given these details God says, Now have them make a sanctuary for me, and I will dwell among them. Make this tabernacle and all its furnishings exactly like the pattern I will show you. (Exodus 25:8-9) And again God later says, See that you make them according to the pattern shown you on the mountain (Ex 25:40). And yet again God repeats: “Set up the tabernacle according to the plan shown you on the mountain (Ex 26:40). The Book of Hebrews, commenting on this pattern says why God insists on the following of the pattern so exactly: They serve at a sanctuary that is a copy and shadow of what is in heaven. (Heb 8:5). In other words, the Ancient Temple was a replica, or a pattern really of the heavenly sanctuary. 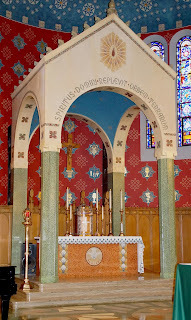 Note the way the scroll work on the floor of my parish (right) matches the four tables on either side in the sanctuary where the animals were slaughtered. The fiery square and horned altar in the photo of the temple (left) is represented by the horned square on the floor of my church (right). In the photo on the left of the ancient sanctuary, the holy place, and the holy of holies towers in the back, as does the high altar and tabernacle in my parish church on the right. Simply put, the builders of my parish church remarkably depict the ancient temple and also the vision of heaven in the book of Revelation. This is what Church building should do: exemplify the heavenly sanctuary, a plan which God himself gave. Sadly, modern architecture has departed from the plan significantly. But in recent years, there has been something of a return, a trend for which we can only be grateful. The Catholic Church is surely a biblical Church. My very building shouts the Word! We Catholics preach the word not only with ink and speech, but also in stone, wood, glass, liturgy and the arts, all to the glory of God. Here is a video of some of the details of my parish.